Minika will attempt to make it two wins from three starts when she graduates to metropolitan racing tomorrow at Ascot. The younger full sister to star sprinting mare Misty Metal was ultra impressive in winning her maiden at Bunbury on the 16th of January. She showed blistering speed in her maiden win and won eased down by 1.5 lengths for rider Shaun ''Shooter'' McGruddy. Tomorrow claiming apprentice Kate Witten will deputise for Shaun who is currently on holiday, Kate's claim will reduce her weight to just 54 kilos and puts her into the race beautifully weighted. Kate has also had a very strong association with Misty Metal having ridden her on five occasions for three wins and two placings. 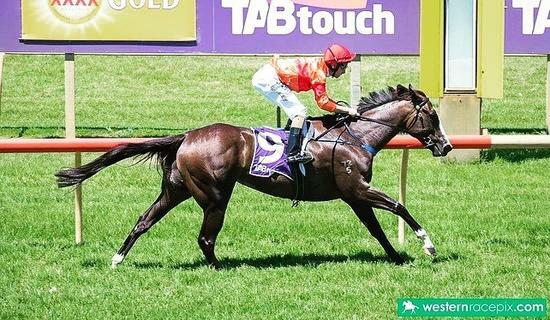 Minika looks to have very strong claims tomorrow afternoon and if the strong family tradition stands up it could be a great result for Harvey Racing and Kate Witten! Good luck to her owners and breeders Lex and Shirley Piper.